If quality of space is just as important to you as quantity, then there are few features you’ll prize more highly than a rooflight. Think of them not just as practical problem-solvers for making extensions brighter and lofts habitable, but as a way of bringing a certain magic to a house: overhead daylight can be highly dramatic, while upward views of the sky can be deeply peaceful. “Nowadays rooflights are available in more styles and configurations than ever before, and they have become an integral part of hundreds of striking self-build and renovation schemes, mainly due to the versatility of the product,” says Roof Maker’s CEO Paul Mildenstein. “When incorporating rooflights into renovation projects, you need to consider whether they need to complement the existing building, or if they can they stand out from any original features,” he continues. Many extensions favour using contrasting materials to the existing house, opening up the possibility for a crisp modern look, but you may want to create a traditional conservatory or orangery, where the roof lantern will be the key decorative focus of the design. 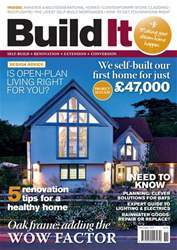 The November edition of Build It magazine brings you all the inspiration & practical advice you need to complete your home building project on time and on budget, including: •	A self-built first home for just £47,000 (page 48) •	Why build with oak? (page 64) •	Rainwater goods: repair or replace? (page 67) •	5 renovation tips for a healthy home (page 81) •	Is open plan living right for you (page 103) •	Expert guide to lighting and electrics (page 112) … and more! Rainwater goods: repair or replace?